There was further evidence of the strength in depth at AFC Rushden & Diamonds at Bedworth United last weekend. Boss Andy Peaks handed first starts of the season to Sam Johnson and midfielder Joe Curtis while Sam Brown also returned to the fold after a recent period of unavailability. 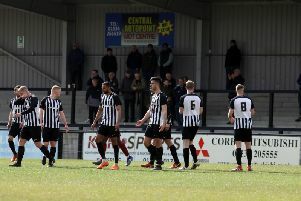 And, despite making those changes, Diamonds picked up a 3-1 success against the bottom side to maintain their challenge for the Evo-Stik League South Premier Division Central play-off places. Peaks will have more tough decisions to make for this weekend’s home clash with Banbury United with Jack Westbrook available again after serving a two-match ban. And young loanees Albie Hopkins and Matt Berry-Hargreaves are also expected to return after they were required to play for the Under-23s of their parent club Oxford United last Saturday. “I think we proved last weekend that the squad is looking strong,” the Diamonds manager said. “We made a couple of little changes and those who came into the side didn’t do themselves any harm at all. “We will have Jack Westbrook back this week and the two Oxford United boys should also be back with us as well so it will look that little bit stronger again, which is pleasing. There was also the welcome sight of Jack Ashton returning to action as a second-half substitute after a spell on the sidelines. The centre-half remains a popular figure at Hayden Road both on the terraces and in the dressing-room and Peaks added: “Jack wants to play in every game and that is the player he is. “But it is important that we make sure he is in the best possible condition. “He has struggled with a couple of knocks but we want him around, he’s a good character to have around the boys. “We just need to make sure we manage his fitness and his enthusiasm."